Will the 15/15A be "Go North East" or will it gain "The 15"? (01/02/2018, 09:19)Michael Wrote: Will the 15/15A be "Go North East" or will it gain "The 15"? Don’t think they’ll brand it the 15 with only 3 buses allocated. 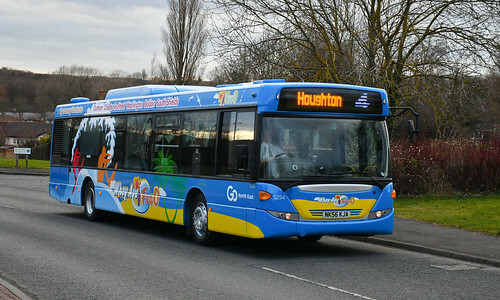 5254 now branded for Whey Aye Five 0 - transferred to Washington this morning, seeing brief use on Red Arrows X1 then later Connections4. Is 5425 still VOR ? There was a comment on 11/12/17 that it had a handbrake fault. I have not seen it on the 20/20A having checked the new App most days for the last 2 weeks or so. (01/02/2018, 18:35)XUP254F Wrote: Is 5425 still VOR ? Fully repaired and painted week before last. Went through PSV test on 25th January (and passed), it's just awaiting sign off now before going back out on the road. What Omnicity's had internal modifications when they were in service on the 19, and where are they now? What were the modifications, just lighting and flooring? Just 5245 - now a Whey Aye Five 0 bus. The others in the batch on Cobalt Connect weren't done as had originally been intended. (01/02/2018, 18:52)Dan Wrote: Fully repaired and painted week before last. Thanks, 5425 is the only GNE Streetlite I have not ridden yet, hence my interest. I've noticed a few odd workings or spare Streetlites appearing on the 20's over the last few weeks. Unfortunately, I haven't been able to identify if there any patterns regarding which purple Streetlite's are missing. A short trip out, maybe see's me notice 2/3 vehicles that aren't purple. Grindon Mill Update: Services 2, 2A, 8A, 39 & 78 are diverting (towards Hastings Hill only) via Kayll Rd, Hylton Rd & Pennywell Industrial Estate. There is no service towards Hastings Hill at Grindon Mill or Wavendon. Services towards Sunderland are using normal route. 5271 is now branded for "Blue Arrow", have to say, looks really smart. (02/02/2018, 19:38)Michael Wrote: 5271 is now branded for "Blue Arrow", have to say, looks really smart. As is 5267 - replacing 4970 and 5203 (which had already been withdrawn). Both now back at Percy Main. There was one in the spray booth when I was there on Tuesday. Looks really good, better than the Solars imo. Have all the diagrams on the Toonlinks changed this week, as from what I’ve seen the links between the various routes at Stanley and Newcastle seem to have changed. I assume in preparation for the Geminis?